Option 1: In fashion and decor, mixing patterns is de rigueur. In this case; however, I think a solid is needed directly adjacent to such a wildly colourful print. Still, I just had to show off the perfectly matching hues in Joanne/JF Fabrics’ Roxbury, a cotton velvet. Maybe I can use it for a throw pillow instead? Option 2: Is grey still the new black? Threadcount’s solid cotton velvet really sets off the multicoloured print. The thing is, I already have a chair reupholstered in this luxe fabric. On to Option 3. 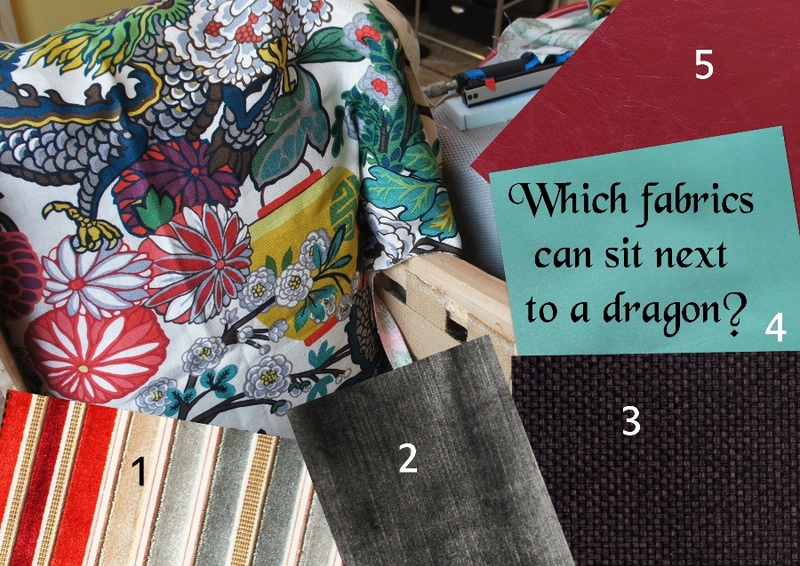 Option 3: A black/brown weave from Joanne/JF Fabrics’ Winning Weaves . At 75,000 Double Rubs, this has astronomical durability, and it’s washable, too. I think it picks up the outlines in the Dragon print and it won’t show the dirt (considering the chair will be shared by 2 humans and 3 fur kids!) I also like the weave texture next to the linen texture of the print – they’re relatable. Option 4: Joanne/JF Fabrics’ Capri in a vibrant blue. It really pops, but I think it’s a bit too much and may take away from our dragon’s roar. Option 5: I just had to include this licorice red because it picked up the reds in our print so well. It’s Joanne/JF Fabric’s Houdini – a faux leather that I’m hoping I’ll get to use on another project. Which fabric will I choose? I have no idea. Stay tuned for the reveal in days to come. This entry was posted in Design, Fabric, Interior Design, Reupholstery, Upholstery and tagged choosing fabric, joanne jf fabrics, reupholstery fabrics, schumacher chiang mai dragon, threadcount fabric, upholstery fabrics, using photoshop elements collage. Bookmark the permalink. ← Is it worth re-upholstering? Did you ever decide? I’m looking for a coordinating fabric for the Aquamarine colorway, and I’d love to see how this turned out! Hello Karen! Thank you so much for reading and for your question! Yes, I did choose a fabric and I think it looks marvelous. It’s the chocolate brown & black weave from Joanne/JF Fabrics. The thing is, I haven’t finished reupholstering my wing chair because I’ve taken on a few commissions doing chairs for others. Still, I will definitely post an “After” pic when I’m done. You’ve inspired me! 🙂 Let me know what you decide and if you send a picture, I’ll post it (would love to see before and after). Regardless, Chiang Mai Dragon will make it shine. Wow – those are great chairs! Realize that you now own two pieces of furniture design history 🙂 You’re in Boston? I hear it’s a great city and has much in common with Toronto. I’m looking forward to seeing the after pics for your chairs. Where do you buy Joanne/JF fabrics? Is it only to the trade? I love the idea of the Roxbury print for a throw pillow (I too have some fabulous dragons in my den and need some coordinating pillows 🙂 ). Thanks for any help! Hello Melissa! Thanks for your interest and for your question. Yes, Joanne/JF fabrics is available only to the trade. I have an account through my business “BespokeUpholstery.ca” so if you live in the greater Toronto area I can order for you and ship to you. Why not contact me at Julie@bespokelife.ca or call 647-847-9037 and we can chat. We’d love to create some custom pillows for you!